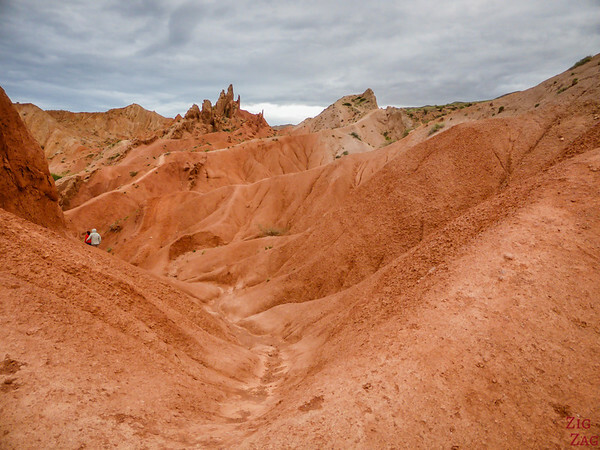 South of Lake Issyk-Kul, hidden in the hills is a magical place: the Skazka canyon, also called the Fairy-tale canyon. 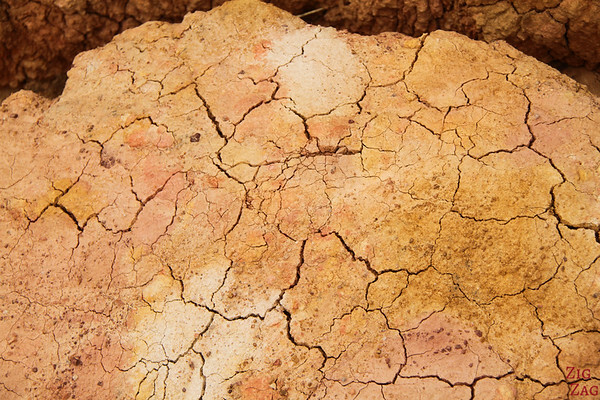 While walking through it, your imagination will go crazy with all the colors and shapes created by the elements. Just look at those pictures and imagine you are in a fairy tale! 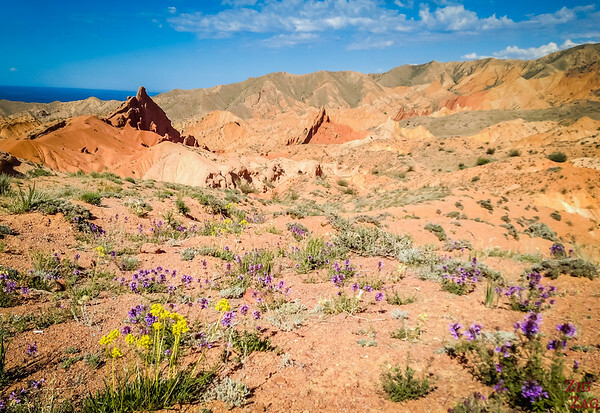 As tourism is increasing in Kyrgyzstan, locals have 'rediscovered' their natural wonders. 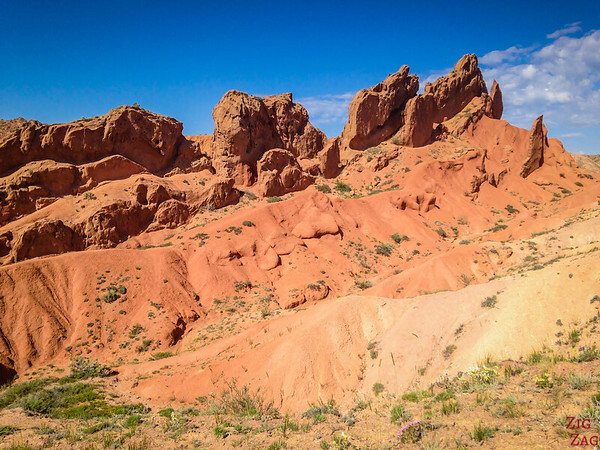 Skazka, near Issyk Kul lake, is a good example. Apparently it has only been indicated on maps and on the road for a couple of years. During my research I had read about it and I was very excited to get there. 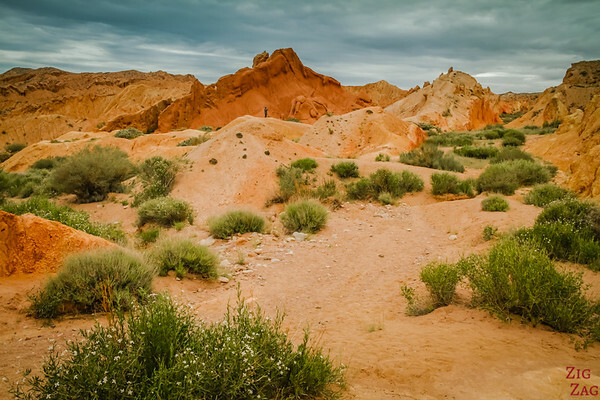 It was one of the main locations I wanted to visit during my tour of Kyrgyzstan. So much so that I went in the afternoon when the others visited the beach knowing we were coming back the next morning. And I do not regret it. This way I had the chance to see it under the blue sky and in a cloudy and windy weather. Very dramatic effects! 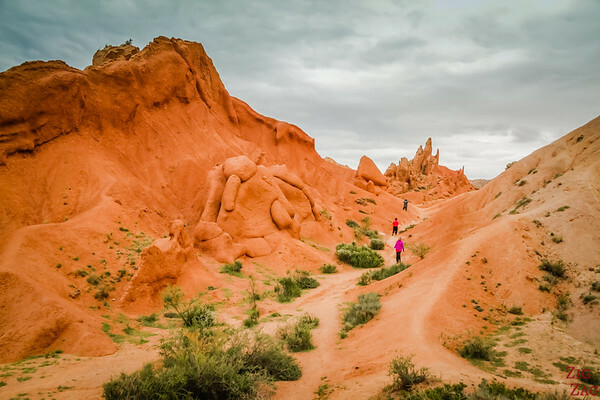 The fairy tale canyon is a place were the red sandstones have been eroded and shaped by the elements.​ There is a large variety of shapes from towers to waves to crest-like rocks. Some people see castles... Hence the name fairy-tale. 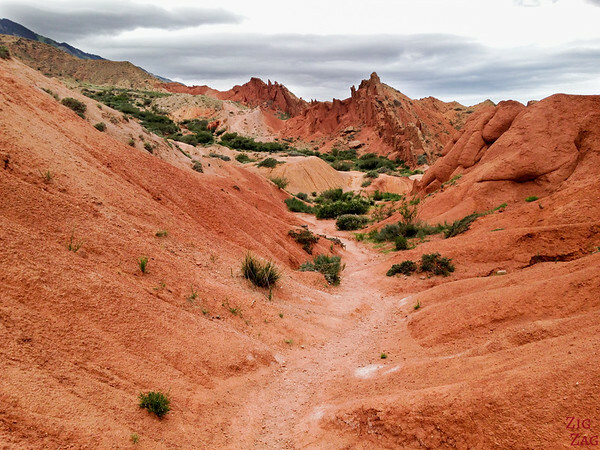 As seen in the picture above, the Fairy Tale canyon is indicated from the main road. 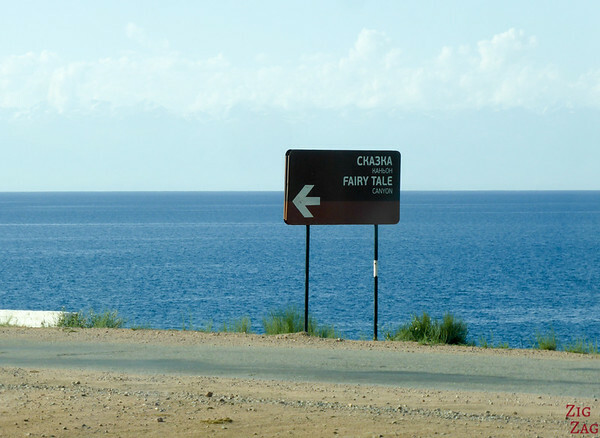 Then turn right at the fork towards what they called 'Jeti-Oguz' on the second sign. You then reach a barrier where you pay and you still have to drive 5 min. 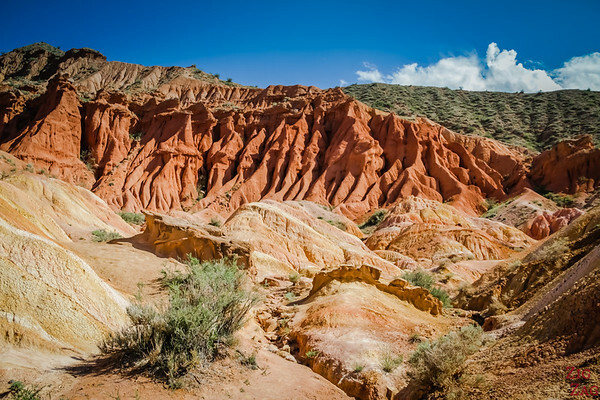 Exploring the Skazka Canyon is one of the best ﻿things to do﻿ in Kyrgyzstan. My first visit was in the afternoon. The weather was very hot and the sun very strong. It really felt like walking in the desert. I was alone in the place except for my taxi driver who climbed to the central high point and made sure I did not get lost with his binoculars. It was so amazing I did not know where to look and could not stop taking pictures. 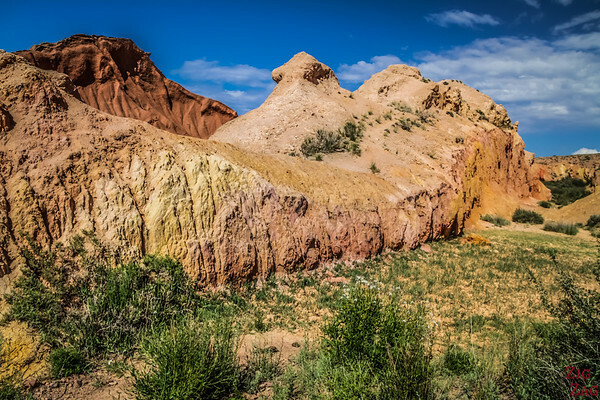 The colors of the rock and of the vegetation on top of the crazy shapes create a unique​ landscape. Then I discovered what I call the snake. I walked along the very colorful rock. 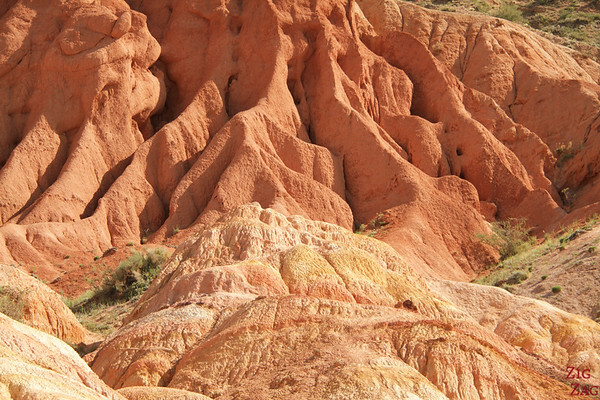 Later the shapes changed into something that reminds you of Cappadocia in Turkey. Those rocks were orange, almost red in some places. I spoted flowers were here and there adding to the color variety. From that spot, I got lost. I tried walking back but found myself stuck with small cliffs. I was exhausted and ended up sliding on my bottom to reach a gorge. There I went one way and finally found the parking. 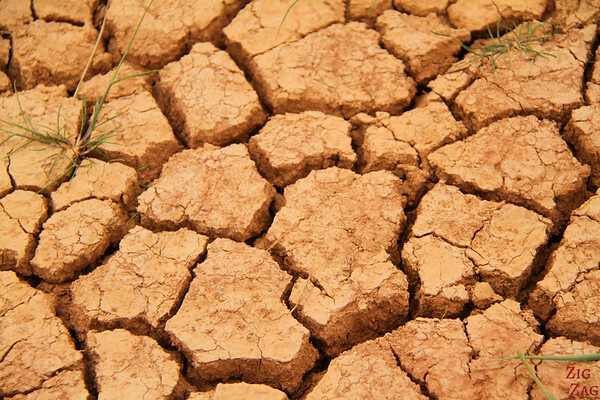 After melting in the heat, we woke up the next days with a cold and cloudy weather. The mood of the place totally changed and the colors were sometimes even more incredible. This time I was with the group, so the pictures will show you the scale. Then I turned around and... where is everyone? I walked a little more towards the west but it became less interesting. 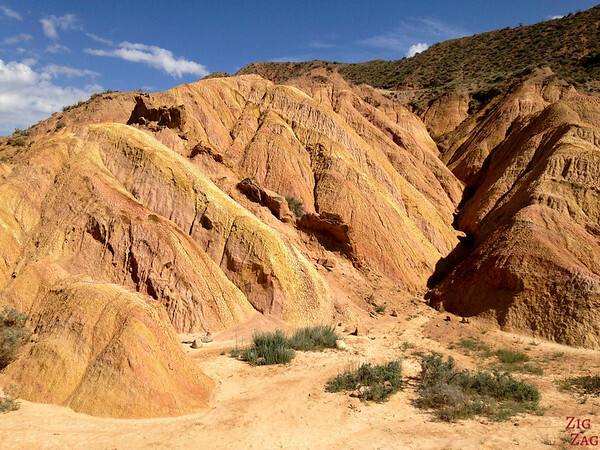 I confirm it was one of my favorite places in Kyrgyzstan. Simply my kind of landscape. 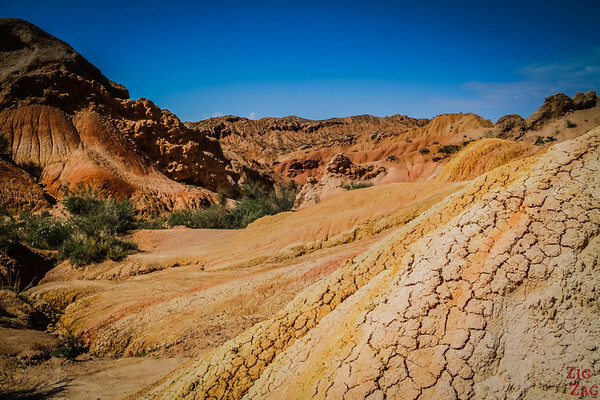 Do you understand why I think exploring the Skazka Canyon is one of the best ﻿things to do﻿ in Kyrgyzstan? 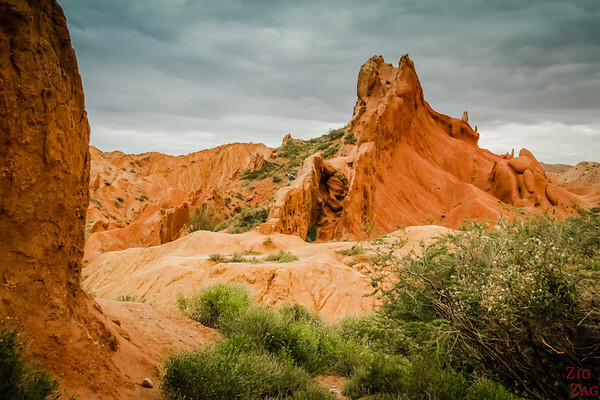 Must see place in Kyrgyzstan. 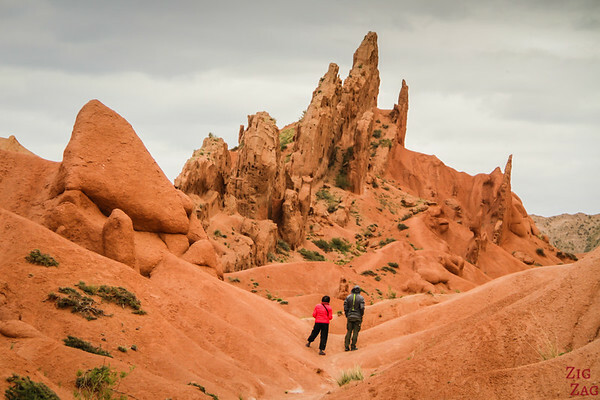 This particular formation is similar to Rainbow hills in Iceland or rock chimneys in Cappadocia… Plan enough time to go explore on your own, climb this rock or that one and discover more intriguing shapes and colorful landscapes.